Lately, Sydney is hearing a lot about agents and conflict of interests! People is talking about how agents may have special relationships with publishers, or may not work in client's best interests if agent is also acting as a publisher. Sures, these is all conflicts of interest! Sydney loves them all! But there is other conflicts of interest that ALWAYS go on with agents, and people never thinks about! These are Sydney's favorites, because nobody ever complains about them! They is so deeply rooted in the agenting business they is invisible! Is like money in the bank! In fact, IS money in the bank Sydney is talking about! See, all money flows through agent! Publisher sends check! Sydney cashes check plenty-quick! Then, Sydney deducts her well-deserved 20% commission! Finally, Sydney cuts check for rest of moneys and sends to writer! But Sydney is just a little cat (agent), and does not study the law, much less obey it! Sydney's interest is that money stays with Sydney as long as possible! Sydney knows that "money in the bank" means "interest," and interest is money that STAYS in Sydney's bank! "you should have it by now! Sydney will send another check soon as can get paperwork through! Only accounting person just started two year sabbatical in Tibet! May be slight, delay!" Meanwhile, Sydney's "conflicted interest" is turning into "compounded interest!" See! Sydney makes clever joke! HAHAHAHAHAHAHA! You got that check yet? 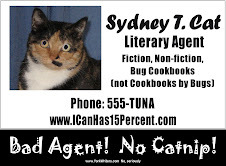 Sydney Wisdom of the Day: Let Bad Agent Sydney Improve Your Writing! Chapter 1: This is good, but good is nots good enough for an opening! Gots to have reader's attention in the first paragraph! This is why a good hook is so important! Sydney suggests sound of electric can-opener. That always gets her attention! Anyway, maybe opens trunk of get-away car, BUT IS ALREADY FULL OF TUNA! See the sweet dilemma! Hero CANNOT throw aways tunas! WHAT WILL DO? You figure out! Also, cut 2000 words. Chapter 3: Wait? Did we start Chapter 3 yet? Sydney was napping again. So bored, could not even start reading this one. Put something interesting at front of chapter. Maybe a piece of yarn, or a bug, or a skittery piece of paper on a tile floor! Sydney always excited by these! Also, cut 3000 words and add more tuna. Chapter 37: Atomic bomb in orphanage? White House in flames? Hero hanging from hang-glider over volcano by toes? Love interest being eaten by ants? You call this a climax? SNOOZEFEST! Needs something EXCITING! Something sends heart racing! Something cannot resist! Something cannot stop looking at! Sydney suggest (they'll never sees this coming!) LASER POINTER on CEILING! Sydney is excited just thinking about it! Also, cut 5,000 words, add another can-opener and make the Yugo into a tuna boat. Finally, to entire manuscript, add 40,000 words (all chapters too short! ), more tuna, and make protagonist a cat. More Bad Hollywood Sydney Wisdom! Sydney is doing so well with last-week's Hollywoods movie scheme, she starts to wonder, why should she only takes Hollywood money from own clients! Sydney then has new ideas! But Sydney thinks, why pays for options, when stupid writers will give to her for free! Here is Sydney's deal: Sydney cold-calls zillion published writers offering to market their books in Hollywood! Sydney will not charges them at all! All they gots to do is sign over all-rights, exclusive, long-term Hollywood option to Sydney! Sydney talks smooth, acts like shes is well-connected Hollywood insider, and drops Hollywood-insider names she learns from IMDB and TMZ! "I has talkings with Johnny Depp the other day, and he was sayings how he would like to do a movie justes like your books! I thinks we could get Sandras Bullock and Mae West and Hally Barry to play the sisters! And we could get little Stevie Spielberg to directs! Or maybe Stan Kubrick or Al Hitchcocks! All is good friends with Sydney! Had tunas with me at Brown Tophat restaurant just the other days!" Some writers does not believes, but others does, and is so star-struck by idea of book being made into big movie, does not even check on Sydney's credentials! (Sydney is agent, remember! Has no credentials!) So gives Sydney big right-grab option for free! Pretty soon, Sydney has whole shopping bag full of options, maybe even with a few names Hollywood peoples who don't read will recognize! Accidentally return Sydney's calls! Sydney gets meeting, spreads out options on table like a deck of playing cards, and says, "takes your pickses! Is all good!" Maybe Sydney gets nowhere, but every once in while, one is bound to pay off! And with Sydney's option agreement, no getting around her! Writer can't sell to anyone else! Movie producers can't buy without going through Sydney! Sydney pays nothing to be deal maker and deal breaker! Good news, client! Sydney has sold Hollywood option on your book! Has sold to new production company called "Bad Producer Sydney" Productions. No relation, of course! Sydney gets you good deal! Not much money up front, but gets you 2% of gross profits, whichs is much better than percent of net profit! In Hollywood, "net" means they will throw net over yous if yous is crazy enough to thinks you will get paid. "Gross" only means it would be gross if they ever actually had to pay anybody! Also, Sydney's name is before yourses in credits! 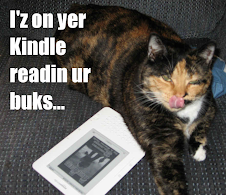 Hey, want to self-publish your work as ebookses, but don't want to do the work yourselfs? Don't have much moneys? Bad Agent Sydney Agency has new service for you! Sydney is now offering full ebook publishing services with NO moneys up front! Just let Sydney collect sales and she takes SMALL percentages, none aboves 15%, to cover the work done by her crack publishing team that she recruiteds from the parking lot in front of Home Depot! Well, Sydney must go now. Has to call client and tell them good newses and bad newses. Good newses is, client sold $10000 dollars worth of ebooks this month! Bad newses is they now owes Sydney $500! How can a cat be an agent? Anybody can prints up cards and call themselves an agent, even a cat! And if it is not permitted, then it is required! Who would sign up a cat for an agent? When word gots out that Sydney was agent, people started asking where to sends submissions. Sydney has to beat off clients with a stick! Nots kidding. Beats them off with stick! Sydney is a boy's name, right? Is youses blind?!! Sydney is dainty little girl kitty! Don't makes me come over there and hurt you!!! What's with all the extra "s"es? Do you have pluralicy or something? Everybody is the comedians! No, stupid-heads! When Sydneys was in agent-school she was in house Slitherin. Does that answers your question? What qualities do you look for in a client? Sydney likes the starry-eyed optimism that blinds all judgement, desperate need for validation, and accesses to a large trust fund! Yours mother must be so proud! 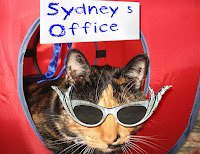 Many agents still charging 15%, but Sydney's worthless clients not making enough moneys for her! So Sydney says to herselfs, "Youses is worth more than that!" So lucky you, if you has Sydney for agent! Sydney is now worths 20%! You mustes have the bestest agent in the business! YOU DOES NOT DESERVE! WORKS HARDER!!!! I've heard you insist your clients obey your instructions. What's up with that? Shouldn't a writer be the master of their own career? Who has you been talking to? You is only writer! Sydney is agent! Agent knows best! Agent tells many writers what to do! You is only one! By definitions, Agent is many times smarter than yous! Yous is only single pellet in Sydney's scatter-gun of success! But how can you tell writers how to write their books? You've never written a book, have you? What! SYDNEY IS WRITING A BOOK RIGHT NOW! BOOK IS JUST A BIG BLOG POST! SYDNEY PUTS ALL BLOG POSTS TOGETHER, HAS BOOK! SCREWS YOU! Well, if it's so easy, why do I need you? But, not only haven't you written a book, you've never been a professional editor either, have you? Sydney is an important crack in the editorial sidewalk to possible-maybe publication!! (Do not step on crack! Sydney's back already under a lotta strain!) Sydney's editorial input has been permeated into many manuscripts to make then suitable for submission to major publisherses! Where they then need to be edited? Well of courses! Whole point of Agent intervention is to make the manuscript just good enough to need real editing! Even if that means making the manuscript worse? Especially if it means making book worse! This is important thing, great secret that only Agents understands! Editors buy books, and editors mustest justify their phoney-baloney jobs! This is secret! Editors is not necessary to publishing process! Not like Agents! Surprisingly, mostest books is rejected by publishers because they is too good! Sydney uses her special agent powers to dull your manuscript down just to the point where it showses editorial promise! This is the sweet spot where editors will bite! Oooookay! Shouldn't there be more questions than this on a Frequently Asked Questions List? Sydney will answer more questions as you frequently ask them. Email Sydney with yourses agent and publishing and especially Sydney questions! Any final advice to writers? ALL WRITERS NEED CAT SUPERVISION! ADOPTS A HOMELESS CAT TODAY! SYDNEY ORDERS YOU!!!! You like to have the last word, don't you? Sydney is always amazed that peoples think that agents can’t be bad agents because they is nice peoples. Just because you likes having drinks with somebody at convention bar is no reason to sleep with them without protections (this is all hypotheticals of course, Sydney is “fixed”) or make them signer on yours checking account. Look at Sydney. Sydney is bad agent, sures (and prouds of it!) but she is also sweet little kitty. Warm and soft. Purrs so loud you can hear in next state. Likes chin rubs, scritches, and warm laps. But down deep (okay, no so far down in Sydney’s case! ), self-interest rules! Sydney wants treats. Sydney wants litter box cleaned. SYDNEY WANTS TUNA! And when Sydney wants, what you wants is not toos important! Sure, Sydney is nice little kitty, but if Sydney is hungry enough, and yous lay on the floor still long enough, SYDNEY WILL EAT YOU!! This is way of the world, silly peoples! So many, maybe most bad agents start out as good people. But one day the cash is short, the electrics bill is overdues, the rent is behind, and agent needs moneys for postage. And there is foreign rights check in in-box. Client doesn’t even know it is theres, and agent knows plenty of cash coming down pipeline to pay back! Where is harm! For writer, money in two weeks will still be money out of nowhere! They still thrilled! Agent is hero, and bills get paid! Where is harm! And now business is changings. Agents’ future place in world us uncertain. EVERYBODY is hungry. And there is all these writers, laying there — very still. Is good to be me… PURRRR!